We have featured a few articles and a photo journal in our newsletters and on the website recently on the mangrove finch and the threat to it by the fly, Philornis downsi. See this YouTube video on how the Charles Darwin Foundation is tackling the fight to control the fly and its devastating effects on the mangrove finch. The American Museum of Natural History hosted a lecture in honour of Lonesome George who is on display at the Museum. The lecture and panel discussion titled Lonesome George and Galapagos Today: What the Tortoise taught Us can be heard and seen here and is well worth viewing with a wide ranging discussion (and some entertaining stories about Lonesome George) on conservation and biodiversity in Galapagos that have wider application as well. 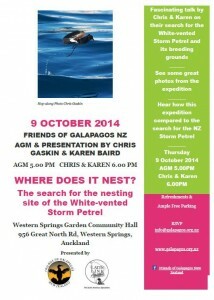 Join us for a great evening hearing about Chris & Karen’s expedition to Galapagos in their search for the nesting site of the Whit-vented Storm Petrel. Hear this inspiring talk on Radio New Zealand as fellow Kiwi Francesca talks about her work leading the Mangrove Finch Project. Francesca has also been working with the White-vented Storm Petrel project team and we featured her in this July newsletter. See this wonderful photo journal from a collaboration between the Charles Darwin Foundation, the Galapagos National Park Directorate, Durrell Wildlife Conservation Trust & the San Diego Zoo on the mangrove finch project where 15 captive reared were released into their natural habitat. Fransesca Cunninghame leads this project and was featured in one of newsletters in July. Galapaface 1 is refloated and removed from the Galapagos Marine Park – see more with this link to our sister FOGO, Galapagos Conservancy, with translation permission from the Galapagos National Park Directorate. Park Rangers along with international volunteers monitor eggs being laid by green sea turtles. Introduced pests and natural predators such as the local bird population are a threat to the eggs and only a very small number of hatchlings manage to survive to adulthood. Read more on this and efforts to protect sea lions in mating season from human disturbance. NZ and Galapagos share volcanic landforms in addition to a number of similar conservation issues. See this informative article about recent research on the source of Galapagos volcanic activity.